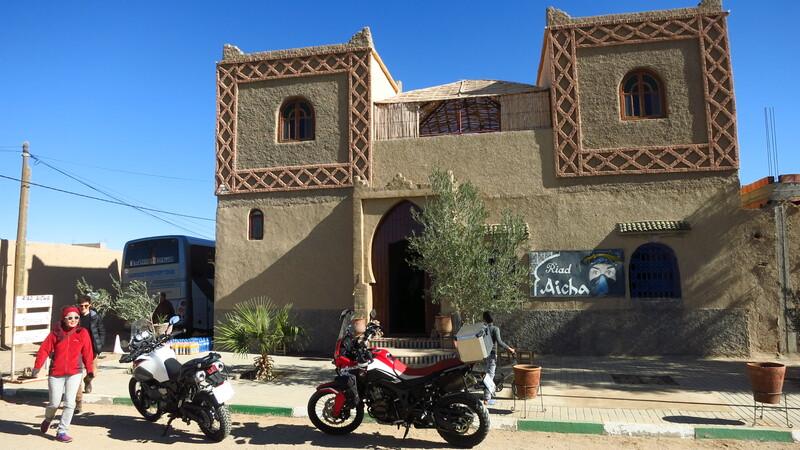 After a rather cold night in our Gite d’Étape, we rose with the sun and headed for Merzouga, the place where everybody goes to get a taste of the Sahara. 4×4 expeditions, quads, motorbikes, tourists on camels, people looking to spend a night in the dunes and see the magical sunset and sunrise all converge on this small town of dusty streets and family run riads where a whole industry has flourished to cover the demand. It took us a while to find our accommodation, but it was worth it. This one was the best place where we had stayed so far, all luxury and nice facilities, and after dropping all our stuff we planned the day. 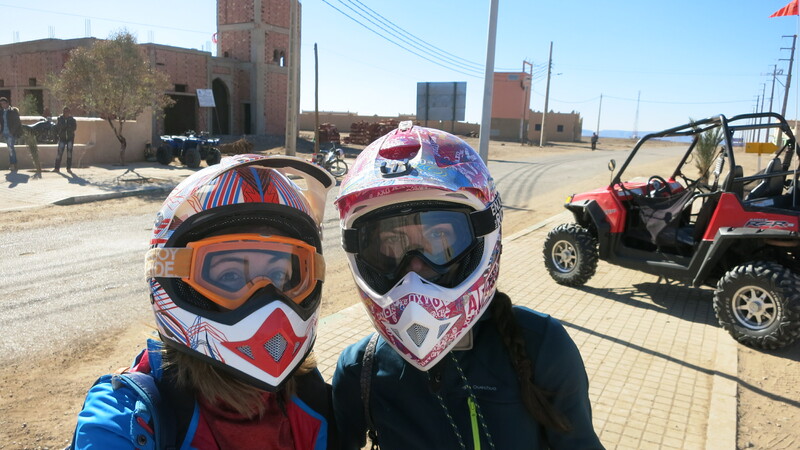 We wanted to go for a ride in the desert and maybe get a taste of the dunes, so we removed all the cases from the bikes and headed out, while the girls booked a tour on quads. 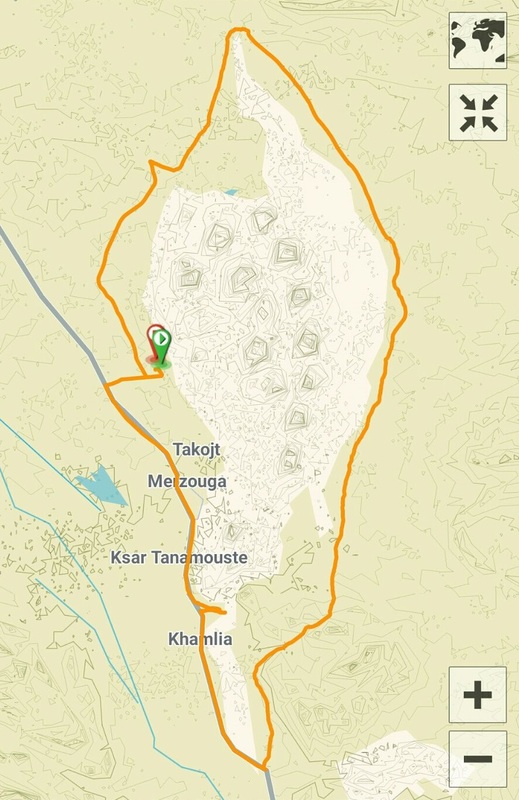 We had a track on the GPS that went around the dunes of the Erg Chebbi, a route that was supposed to be a bit under 50km, and we started heading south and then turned left into a track of hard packed sand and stone. 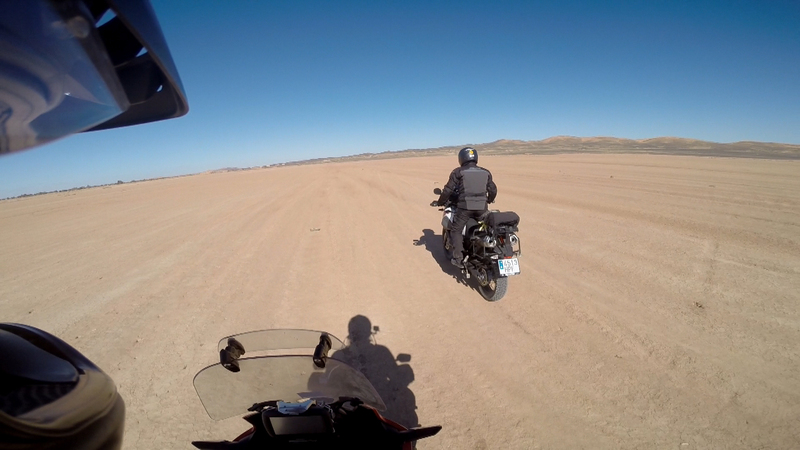 However, after just a couple of kilometres we run into soft desert sand and the front wheels of our heavy bikes dug in. Not being expert offroad riders, we decided to head back to the road and ride a bit further south to find harder ground that would allow us to ride all the way round the dunes, which was our original intention. A bit further south we found another track that looked good and headed into the desert – it was easy terrain and we soon started to enjoy the amazing landscape, with some very gentle rocky hills where we came across some ruins of what seemed to have been a village in the middle of nowhere. As we rode through it we saw that there was at least one house that was still inhabited. Past the village the landscape changed into a vast open space and we could see rocky hills far in the distance and much closer, to our left, the majestic dunes of the Erg Chebbi. We were riding north along the east side of the dunes, and having started the route further south than we had intended, we set a time and/or petrol level limit, at which point we would decide whether we could continue and complete the tour or head back the way we had come. Some kilometres further up we ran into softer terrain, not dunes but patches of softer ground, where we had to be more careful, and we rode past a bereber tent here and there. A 4×4 also going north but travelling much faster caught up with us and we took the chance to ask them how much further it was and whether the terrain was going to get much softer, and they reassured us that it was passable on our bikes. After the 4×4 left, a bereber riding a small motorbike appeared out of nowhere and started to ride along us, showing us the best ways to avoid soft terrain and washboard. We kept going and going for what it felt like hours, and we started finding more and more patches of soft ground, which turned into desert sand, making our progress slower. 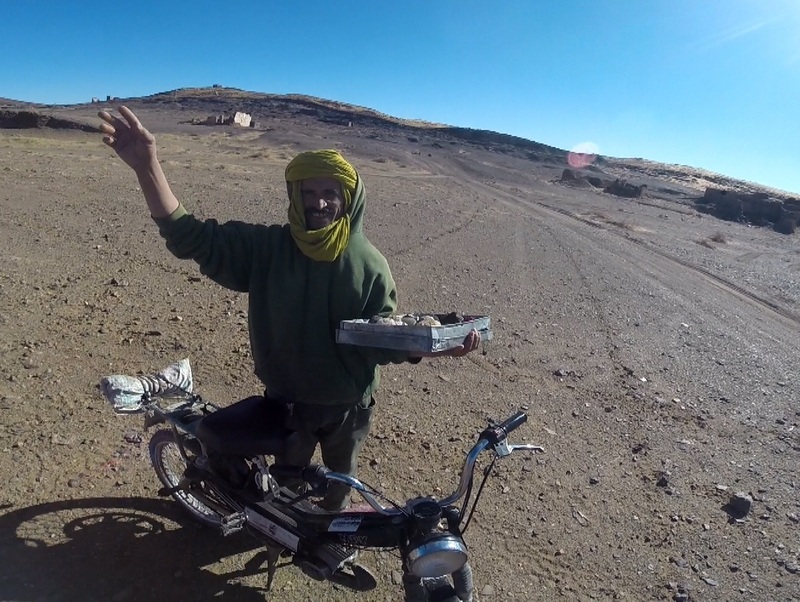 Our bereber friend stopped and in very basic French told us that he was near home – we understood that he lived in some settlement nearby – but if we wanted, he offered to show us the rest of the way to complete the tour and get back to Merzouga. We agreed that it would be better to have him around, as he knew which way to go to avoid the sand, of which there was more and more, and negotiated a price of about 6 euros. There was quite a lot of sand now, and we were getting tired. All of us had several ‘moments’ where we were about to taste some sand, but we all managed to keep the bikes upright with more or less style. 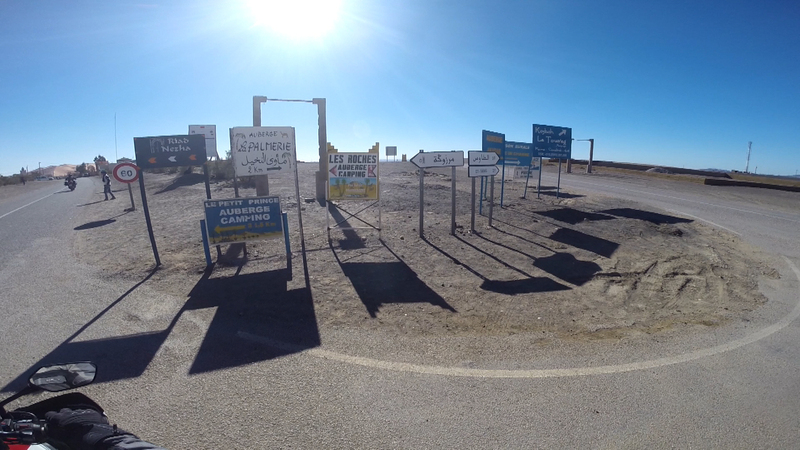 We finally reached the northernmost part of the route and started heading down southwest. 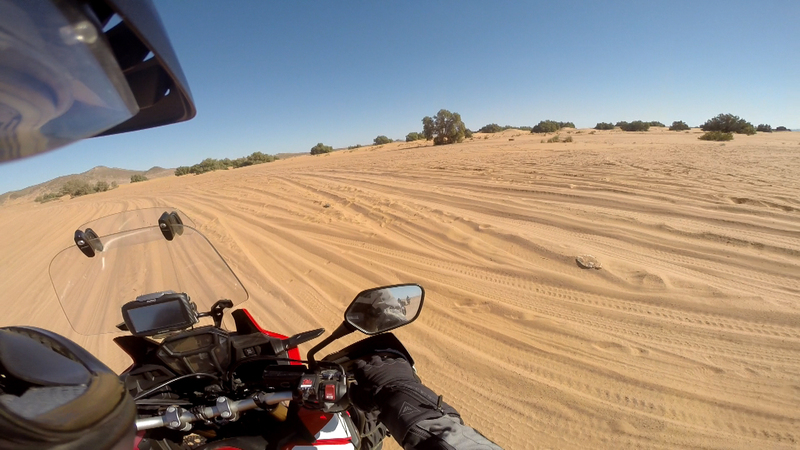 The ground turned harder again as we got further away from the northern tip of the Erg Chebbi, but with just a few kilometres to go, as he reached a crest Esteve hit a soft spot, his bike slipped from the back and he ended up on the ground. I opened the gas the get to him faster and help him, but he was already up and lifting his bike on his own. He had not got hurt and the only damage on his bike was a bent brake lever which we tried to straighten as much as we could to make the bike rideable again. After the incident we reached the road to Merzouga in a matter of minutes, said goodbye to our guide and headed into town to find a place where Esteve could get the brake lever into proper shape. We asked in our riad and were directed to a local workshop where they repaired the lever while we cleaned and oiled the chains in our bikes, which were completely covered in dust. The girls texted us that they had already come back from their quad tour inside the Erg Chebbi, which had been great, and had gone for a walk to visit the town, and when the lever was fixed we saw that we were still in time to see the sunset from the dunes behind Merzouga, so we started the bikes and rode a bit into the desert until we found a small dune and sat on it to see the sun go down over the town.